1. The first priority is the benefits of world as a whole or the benefits of society as a whole. Benefits of party come after that. If the world becomes better, our country will become better. If our country becomes better, our life will become better. 2. There must not be a lie with regard to the policy of World Party. 3. There must not be corruption in the World Party. We must be strict with regard to fund. It is planned that the Third World Party Convention will be held in 2019, and the Fourth Convention in 2023. The most important object of the Convention is to adopt the World Party Declaration. Mr. Toshio Suzuki, President of World Party visited World Party Nepal in June 2018 to prepare for the Third World Party Convention in 2019. The below is the photo of that meeting. The Third World Party Convention will be held in Kathmandu, Nepal, in December 2019. The most important object of the Convention is to adopt the World Party Declaration. In the Convention, seven Directors of World Party and a guest are invited from Japan, Ghana, and Bangladesh. People in the photo are members of World Party. They will organize the Convention. 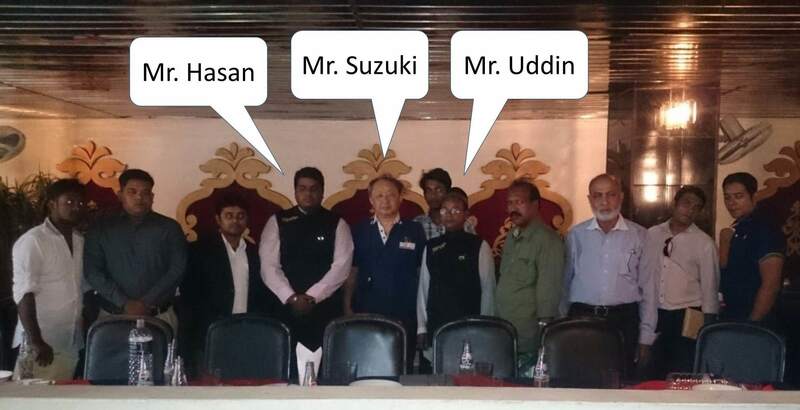 Mr. Md Mahmudul Hasan, World Party Bangladesh, President of World Party Bangladesh, organized a seminar and invited Mr. Toshio Suzuki, representative of World Government Institute, World Party, World Citizen Network. 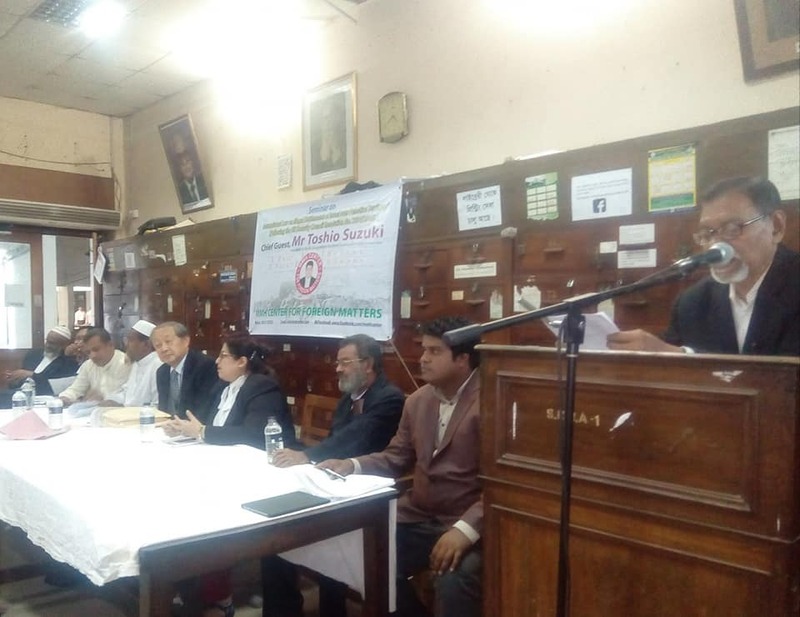 It was held on "International Law on the Illegal Settlements of Israel over Palestine Territory" (Following the UN Security Council Resolution No : 2334 of 2016) at Supreme Court Bar Association, Hall No: 01, Dhaka, Bangladesh on 31 October 2018 . The Chief Guest was Mr. Toshio Suzuki. Attendants were 40-50. Several speakers spoke their opinion on the topic, Illegal Settlement. Actually, the problem of illegal settlement of Palestine must be recognized. 2. World Party Declaration (Draft of the Declaration to be adopted in December 2019). 3. World Party Monthly Report (section of October 2018). 4. Three copies of my book, "Soul Federation". After the seminar, Mr. Md. Mahmudul Hasan wrote the Constitution of World Party Bangladesh. So, official branch of World Party Bangladesh was founded and Mr. Hasan became the President of World Party Bangladesh. 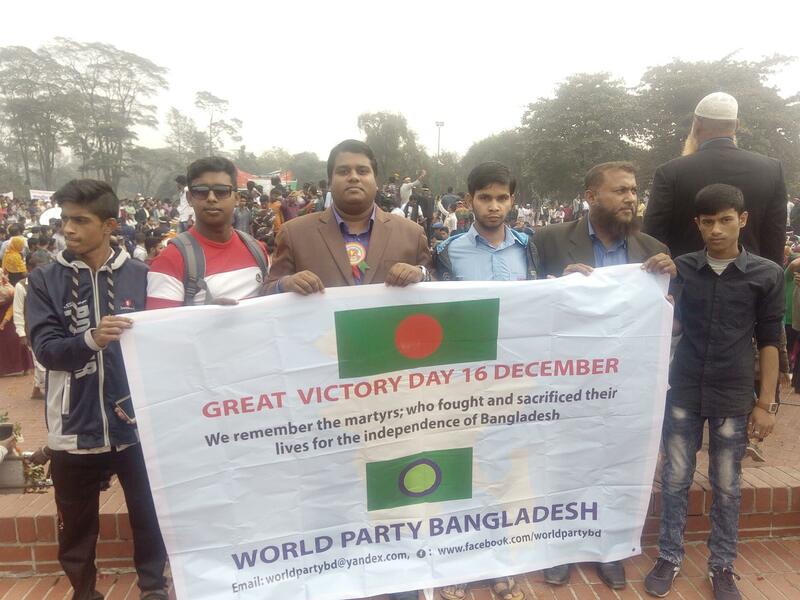 Mr. Hasan celebrated the Victory Day of Bangladesh on 16 December 2018. Mr. Hasan (center) is celebrating the Victory Day of Bangladesh with other members. As shown above, the flag of World Party Bangladesh has been decided. Also the website World Party Bangladesh has been opened. 1. Our members stand for the election of the members of National Parliament of each country. 2. We promote the movements of establishing the World Federation by holding the World Party Convention or committee. If the World Federation is truly good, it will be a common sense in the future. We are going to hold the World Party Convention in Nepal in 2019. Members of World Party Nepal will organize the Convention. Furthermore, Directors of World Party will be invited to the Third World Party Convention. All the cost will be paid by Mr. Toshio Suzuki, the President of World Party. World Party is planning to send candidates to the election of members of National Parliament of each country. 1. Write a draft of the Statute of branch of World Party in each country. 2. Hold the Convention of branch of World Party. The number of attendants in the Convention must be at least 10. The draft of Statute is adopted and the President of branch of World Party is elected in this Convention. 3. The amount of deposit of candidate to the the Election Administration Commission must be specified in advance. 4. Remittance of fund for election from foreign countries including Japan is allowed. 5. Directors from foreign countries are allowed to make a campaign for the candidate for the election of National Parliament in the country of branch. If the statute of branch is adopted, the President of branch is elected, and a member of the branch stands for the election of members of the National Parliament of her/his country, the President of World Party will consider paying the necessary cost for election. Needless to say, the President of World Party will visit the branch. The President of branch will be invited to the World Party Convention in 2019. Needles to say, all the cost is paid by the President of World Party. If assistance from abroad is difficult, we will think of other measures. Here, types of members are as follows. A. Registered with the next World Party Convention and paid-up as a member of each branch of World Party. B. Registered with the next World Party Convention but not paid-up as a member of each branch of World Party. C. Not registered with the next World Party Convention but paid-up as a member of each branch of World Party. D. Not registered with the next World Party Convention and not paid-up as a member of each branch of World Party. Or, name is not publicized. But address needs not be publicized. It is planned that the Third World Party Convention will be held in 2019, and the Fourth Convention in 2023. A Workshop organized by Mr. Kongjak Jaidee was held in Thailand on 11 February 2017. The Editor (Toshio Suzuki) participated in it. For details, please see the March issue of World Party Monthly Report. If the World Federation is truly good, it will be a common sense in the future. At present, some people of World Party Nepal is proposing holding the Third World Party Convention in 2019. Furthermore, Directors of World Party will be invited to the Third World Party Convention. All the cost will be paid by Mr. Toshio Suzuki, the President of World Party. World Party is planning to send candidates to the election of members of National Parliament of each country. The cost for election is paid by the private money of Mr. Toshio Suzuki, the President of World Party. At present, only few candidates are possible. 1. A branch statute must be established. The statute is adopted in the convention of branch. 2. The President of branch must be elected. The President of branch can be elected in the convention of branch. The number of attendants must be at least 10. 4. Remittance of fund for election from Japan is allowed. When the convention of branch is held and the President of branch is elected, the President of World Party will attend it. If the President of branch is elected and a member of the branch stands for the election of members of the National Parliament of her/his country, the President of World Party will consider paying the necessary cost for election. If the President of branch is elected, the President of World Party will invite her/him to the Third World Party Convention in 2019. Needles to say, all the cost is paid by the President of World Party. The Second World Party Convention, the Second World Citizen Network Convention, and the Joint Conference of Bangladesh People's Democratic Party (BPDP) and World Party were held in Dhaka, Bangladesh, October 2015. If the World Federation is truly good, it will be a common sense in the future. At present, some people of World Party Nepal is proposing holding the Third World Party Convention in 2019.
will be held in 2015, and the Third Convention in 2019. The President of the World Party, Mr. Toshio Suzuki, visited Bangladesh for the preparation of the Second World Party Convention, the Second World Citizen Network Convention, and a joint Conference of Bangladesh People's Democratic Party (BPDP) and World Party. He met people of Bangladesh People's Democratic Party (BPDP) and people of Buddhist in Cox's Bazar. The below is photos of them. Bangladesh People's Democratic Party (BPDP). 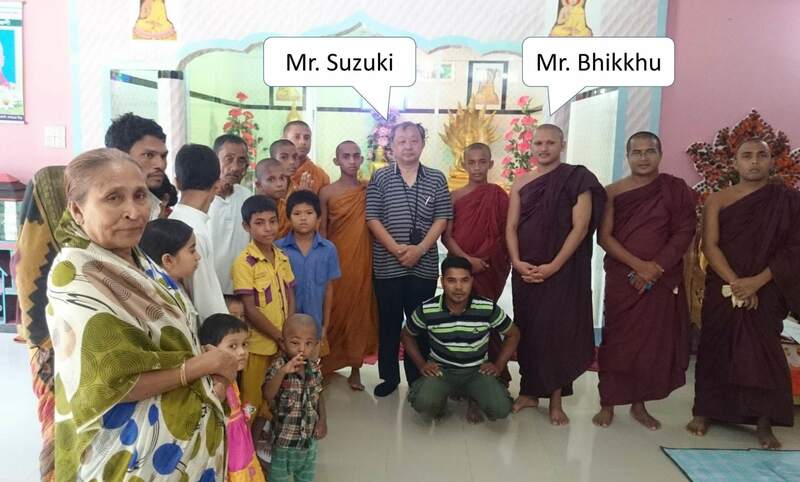 Buddhist people in Cox's Bazar. He made a preparation for the following events. The Second World Party Convention will be held in Cox's Bazar, Bangladesh in October 2015. The World Party will invite two members of World Party Ghana, Mr. Iddrisu Safianu and Mr. Nashiru Abdulai who participated in the First World Party Convention in Ghana in 2011. Mr. Uddin and Mr. Hasan, who are the members of the World Party Bangladesh, said they will participate in this Convention from Dhaka. After 1 year from the registration with the World Party, member can be official delegate. The most important object of the Convention is to adopt the World Party Declaration. So, participants must read the draft carefully. If there is criticisms or objections, they should be submitted as early as possible. At least 3 months before the Convention, any criticism and objection must be understood and the contents should be revised. At the Convention, the process of adoption should be done smoothly. After the World Party Convention, the World Citizen Network Convention will be held. Prior registration is not necessary to participate. So, like-minded people and organizations are welcome. Especially, Muslim people should be invited. If we can form a friendly relation between the Buddhists and the Muslims, attacks to temples may be reduced. After above two events, we will hold a joint conference of the Bangladesh Peoples Democratic Party (BPDP) and the World Party in Dhaka. We will invite other political parties. Each party can insist on their own opinion and we must try to understand it. We will inform mass media such as TV, newspaper, etc. The most important object of the World Party Convention is to adopt the World Party Declaration. New Constitution of Japan, World Parliament Statute, and Constitution of World Federation are being prepared. They have not been completed yet. But basic thoughts are already written. Pages are New Constitution of Japan, World Parliament Statute, and Constitution of World Federation. A Registered with the next World Party Convention and paid-up as a member of each branch of World Party. B Registered with the next World Party Convention. Not paid-up as a member of each branch of World Party. C Paid-up as a member of each branch of World Party. Not registered with the next World Party Convention. D Not registered with the next World Party Convention and not paid-up. Or, name is not published. However, address needs not be published. World Government Institute Japan and World Party Japan are administering the following accounts. Accounts are published in each site. 1 Dollar is about 120 Yen in January 2015. 1 Dollar was about 120 Yen in January 2015.
in 2015. 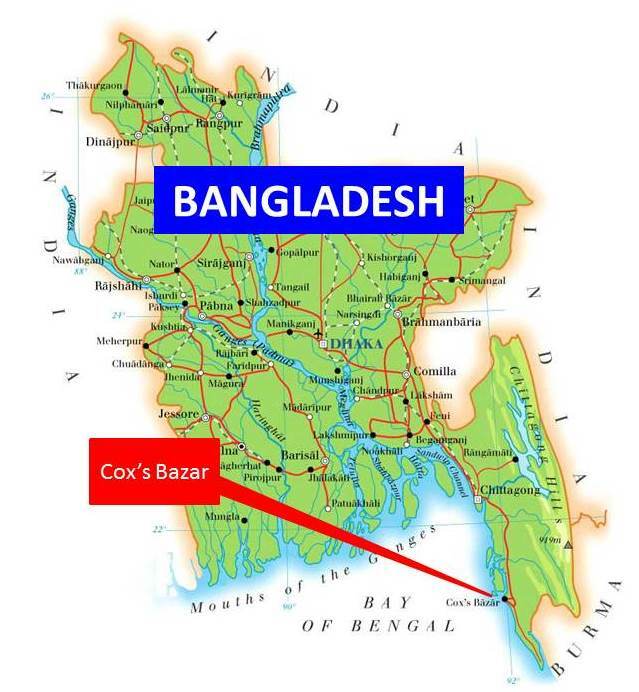 The venue is in Cox's Bazar as shown in the figure below. After the World Party Convention, the　Second World Citizen Network Convention will be held. No prior registration is necessary for the World Citizen Network Convention. We would like you to participate and speak. For more detail, please visit our website. Especially, World Party Monthly Report will provide the latest information. A Registered to the next World Party Convention and paid-up as a member of each branch of World Party. C Paid-up as a member of each branch of World Party. So far, the World Party Annual Report was published for the period from 1 April to 31 March. But, from 2014, it is published for the period from 1 January to 31 December. The World Party Japan was registered to the Election Administration Commission of Chiba Prefecture in Japan in May 2012. At the time of registration, the statute of the World Party Japan that is in the branch list of the World Party and that of the World Party Japan that was registered to the Commission were different. In January 2013, the statutes of World Party Japan were unified and the revised statute was submitted to the Commission. By this procedure, the World Party Japan in the branch list and the World Party Japan registered to the Commission were unified. Now the World Party Japan can accept donation without tax. The venue and the date of the Second World Party Convention is being prepared. It is expected that the Second World Party Convention will be held in 2015, and the Third Convention in 2019. Journal of the World Government Institute, Voice for World Government, has been published for the first time in 6 years. Editor of this editor is Mr. Taishiro Sonae, World Government Institute Japan. Mr Jacek Deptula is a doctor and an activist in France. He wrote a paper "Planet's Cancer: A Call for World Government", and sent it to the World Government Institute. His paper is shown in ARTICLES AND MAILS. In his paper, he advocates "International World Union Party". This Party is essentially same as the World Party. A pamphlet of the World Party Japan was made. Now an Japanese version is available. But English version will come soon. Please visit Pamphlet. 1 Dollar is about 97 Yen in April 2013. 1 Dollar was about 81 Yen in April 2012. The First World Party Convention was held in Accra, Ghana, Africa on 12 August 2011. The Convention is the supreme body of World Party. The seats of the Convention are one thousand and they are apportioned in proportion to population of each country. Each branch can register three times as many as the official delegates. From these registered delegates, each branch can send the official delegates. Registered delegates from each branch must get registered at least one year before the Convention. So, only the members who had got registered by 12 August 2010 could participate in the Convention as the official delegates. If there are problems in the registered delegates, other registered delegates can object to the registered delegates. If the objection reaches 5% of total votes, the objected delegates must be removed from the registered delegates. So, there is no corruption in the World Party. In case of World Party Ghana, the seats were 3.49. The first decimal place is not zero, so it is rounded up to 4. So World Party Ghana could register 12 delegates (4 multiplied by 3 is 12). From among these 12 delegates, 4 delegates could participate in the Convention as the official delegates. For the detail of calculation, please see the World Party Statute. The above is the photo of the Convention. Participants of the Convention were the two official delegates of World Party, one World Party member, and three other participants. The official delegates were Mr Toshio Suzuki, World Party Japan, and Mr Nashiru Abdulai, World Party Ghana. Another World Party member was Mr Karl A.Y. Kpodo, World Party Ghana. Three other participants were Mr Iddrisu Safianu, Ms Diana Anyidoho, and Dr Kwaku Osafo. The below is two official delegates, Mr Toshio Suzuki, World Party Japan, and Mr Nashiru Abdulai, World Party Ghana. Following issues were passed at the Convention. The World Party Statute was explained by Mr Suzuki and was adopted. The World Party Declaration was explained by Mr Suzuki and was adopted. Mr Toshio Suzuki was elected as the President. Mr Nashiru Abdulai was appointed as the Vice President by the President. An inappropriate member was dismissed. He declared that he holds the doctorate. So Mr Suzuki cross-checked it including investigation of sending an envelope for reply and two international reply coupons. But he did not send the copy of certificate and the date of birth. Furthermore, he wrote an article on the website suggesting that the website "w-g.jp" is under his control. These issues were carried out by the two official delegates. Besides these issues, Dr Kwaku Osafo and Mr Karl A.Y. Kpodo delivered speech. World Citizen Network Convention was involved in the World Party Convention. Dr Kwaku Osafo gave us advice to promote World Party. Mr Karl A.Y. Kpodo spoke on the sovereignty. After speech, we discussed many things. For more detail, please see the World Party News. There were donation from Mr Takeo Nakamura and Mr Toshio Suzuki. Total budget for the Convention was 39 thousand yen. Among this, 29 thousand yen was donated by Mr Nakamura and 10 thousand yen was donated by Mr Suzuki. These donations were converted into 486 US dollar. Mr Nashiru Abdulai, World Party Ghana, sent a report on the expenditure. $200 for the Venue at African Regent Hotel. $60 for Coffee/Tea for Members at the Restaurant. $75 for telephone and stationery. $101 a balance which would be used to convey post-conference meeting/seminar in Ghana to strategize for the way forward. It is expected that the Second World Party Convention will be held in 2015, and the Third Convention in 2019. The second one will be held in larger scale. 23 May: World Government Institute Malaysia was founded. 18 September: World Government Institute Mali was founded. 2 December: World Government Institute Singapore was founded. Branches were 54 on 31 December. 20 March: World Government Institute Rwanda was founded. Branches were 55 on 31 March. 23 May: World Party Malaysia was founded. 12 August: World Party Convention was held in Accra, Ghana. World Party Statute and World Party Declaration were adopted. 18 September: World Party Mali was founded. 2 December: World Party Singapore was founded. Branches were 53 on 31 December. 20 March: World Party Rwanda was founded. Branches were 54 on 31 March. 23 May: World Party Malaysia joined. 9 August: Movement of United World State "JUZEVA" (Lithuania) withdrew. 12 August: World Citizen Network Convention was held in Accra, Ghana. 18 September: World Party Mali joined. 2 December: World Party Singapore joined. Members were 65 organizations and 1 individual on 31 December. 20 March: World Party Rwanda joined. Members were 66 organizations and 1 individual on 31 March. 1 Dollar is about 84 Yen in April 2011. Twenty-two thousand Yen was spent for the World Party Convention in Ghana. Mr. Takeo Nakamura (Japan). 8,000 Yen. Thank you very much for donation. The donation was spent for the World Party Convention in Ghana. Seven thousand yen was spent for the World Party convention in Ghana. Ms. Kazuko Suzuki (Japan). 20,000 Yen. Thank you very much for donation. Donation will be spent for truly meaningful things. World Party Convention is held once in four years following the World Party Statute. The Convention is the supreme body of World Party. The seats of the Convention are one thousand and they are apportioned in proportion to population of each country. The seats of the Convention is shown in the Branch List of World Party. Each branch can register three times as many as the official delegates. From these registered delegates, each branch can send the official delegates. Registered delegates from each branch must get registered at least one year before the Convention. So, only the members who had got registered until the end of July 2010 can participate in the Convention as the official delegates. If there are problems in the registered delegates, other registered delegates can object to the registered delegates. If the objection reaches 5% of total votes, the objected delegates must be removed from the registered delegates. So, there is no corruption in the World Party. In case of World Party Ghana, the seats are 3.49. The first decimal place is not zero, so it is rounded up to 4. So World Party Ghana can register 12 delegates (4 multiplied by 3 is 12). From among these 12 delegates, 4 delegates can participate in the Convention as the official delegates. For the detail of calculation, please see the World Party Statute. At the Convention, World Party Statute is adopted, President is elected, and basic policy of World Party is identified. The World Party Declaration will be issued at the closing session. The World Party Convention is the base of authority of World Party. First World Party Convention is going to be held in Ghana, Africa in August 2011. Idea of World Party is explained in a paper "International Party for the World Government" or a book Soul Federation which is available from Amazon or Xlibris Online Bookstore or ordinary bookstore etc. World Party Declaration declares the basic policy of the World Party and the draft is shown below. Members of World Party can propose opinions for the World Party Declaration. The Convention will be held in August 2011. So proposals are accepted by the end of June 2011. This is the declaration declared at the World Party Convention held in Ghana in August 2011. World Party is an international party dedicated to the establishment of World Federation and World Government. Here, the World Federation is a worldwide federation of independent countries and the World Government is the central government of federation. We are World Citizen. We the people heartily hope world peace and human happiness. We believe that our duty is to establish the world democracy. Our basic policy is to establish World Federation and World Government. There are three principles of World Party as shown below. 2. There must not be lie with regard to the policy of World Party. In the following part, declarations and vision are stated in terms of international affairs and domestic affairs in each country. The declaration shown here has been authorized by the World Party Convention. This authorization is the base of authority of World Party and each branch of World Party. This authorization enables World Party and each branch to get the support of people. Basic benefits of World Federation and World Government are are follows. 1. World Federation and World Government can reduce or prevent the war, and so the destruction by war is reduced or prevented. 2. World Federation and World Government can reduce the military expenditure. 3. Fluctuation of exchange rate will be removed because the World Central Bank will issue the international common currency. World Government which we aim to establish is concerned with only limited aspects of society. Namely, in principle, it is concerned with only the administration of military force, the issuance of currency, and other political and economic problems that individual country cannot solve alone. Other aspects of society such as religion, political and economic system like liberalism or communism, industry, agriculture, commerce, science, arts, sports, tradition, and so on are left free to each country. Politics and religion are divided in the World Party. Religion is recognized as a private matter and so any religion is allowed in the World Party. World Party has one branch in each country. World Party is the International Secretariat of each branch. World Party has no personal member. Members of World Party are branches in each country. Branch of each country has personal members. Basic policy of each branch of World Party must be same as that of World Party. Here, basic policy is to establish World Federation and World Government. But, each branch can have its own policy. Therefore, each branch can declare either the liberalism or communism. Namely, a branch of World Party in one country can declare the liberalism and another branch in another country can declare the communism. Politics and religion are divided in branches also. At present, World Federation and World Government do not exist. So World Party is aiming to establish the World Parliament without legislative power like European Parliament. Process to establish World Federation and World Government is shown as follows. As shown above, each country sends delegates to the World Parliament and the delegates are apportioned in proportion to population. Total number of seats is basically 1,000. The World Parliament in the initial stage is a consultative assembly without legislative power. If the Parliament functions well, it will get the legislative power and enact the World Constitution. World Party has a branch in each country. Branch in each country promotes the policy of electing the delegates for the World Parliament. Seats of each country are apportioned in proportion to population, and method of calculation is shown in a table below. Source of statistics of population is the statistics of United Nations. The date of statistics is June 2009. This statistics is used until World Party Convention in August 2011. World population is 6,829,297.0 thousand, of which China has 1,345,751.0 thousand, India has 1,198,00 3.3 thousand, USA has 314,658.8 thousand, Japan has 127,156.2 thousand, and Assumed Country has 1.0 thousand. Total number of delegates is basically 1,000 and the seats are apportioned in proportion to population. So, in case of China, votes are 197.0556. In this case, the first decimal place is zero. So, it is rounded down and the adjusted votes are 197.000. So, the official delegates are 197. In case of India, the votes are 175.4212 and the first decimal place is not zero. So it is rounded up and the the adjusted votes are 176.000. And so the official delegates are 176. In cases of USA and Japan, the adjusted votes are calculated similarly. In case of Assumed Country, population is 1.0 thousand. So, vote is only 0.0001. This is rounded up to 0.001. So, this country can send a delegate with 0.001 vote. By this measure, all the votes are classified into 4 classes, 1, 0.1, 0.01, and 0.001. Furthermore, there are some conditions for participation in the World Parliament. 1. Delegates to World Parliament have to be directly elected by people. If delegates are sent without election, they are not accepted as official delegates. They can attend as observers. 2. Delegates from each country must get registered to the international secretariat of Parliament as a delegate to Parliament at least one year before the opening of Parliament. But the registration for participation in the Parliament is accepted even on the day of the Parliament. 3. A country can have registered delegates three times as many as the number of seats in the Parliament. For example, if the seats of a country in the Parliament is 10, the country can have 30 registered delegates. From among these 30 delegates, the country can send 10 delegates as the official delegates. 4. If there are problems in the registered delegates, other country can object to the registered delegates. For example, if a registered delegate was not directly elected by people, other country can object to it. The number of votes of objection depends on the number of votes of registered delegates of each country. If the objection reaches 5% of total votes of registered delegates, the objected delegates must get the recognition from other countries. The recognition can be got in two ways. One is to get the recognition at the World Parliament. Another is to get it by document. In the former process, the objected delegates can get the recognition when more than half of effective votes recognize the objected delegates. In this case, abstention is not counted. For example, if the number of votes are 1 hundred and 49 are in favor, 48 are against, and 2 are abstention, the recognition is not more than half of total votes. But if the abstention is not counted, the recognition is more than half. 5. The vote of delegate cannot be entrusted. Namely, only attending delegates can have the vote. So, if a country that has 10 votes sends only 5 delegates, the votes of the country are 5. 6. Total vote of a country is, at the maximum, 20% of total votes of attending delegates. For example, if attending delegates are 50 and delegates from one country are 30, the votes of the country is 60% of total votes. But the effective votes of the country are 50 x 0.20 = 10. There is a definite reason why we have to establish the World Parliament. World Parliament is a place for discussion. Development of technology such as airplane, engine, electricity, computer has been contributing to the civilization. But, in a sense, discussion by people is much more important than the technology. In the primitive age when there was no agriculture, it seems that people were very poor. But they could live somehow. In the feudal age when there was agriculture, most people were poor but there were some surplus in the society as a whole. Namely, although there was no professional soldier and no landlord in the primitive age because society was too poor, there was some surplus and so there were professional soldiers and landlords in the feudal age when there was agriculture. Professional soldiers and landlords do not produce the necessities of life. So there must be surplus in a society as a whole when they exist. For example in Japan in the Edo Period (1603-1867), there were Samurai and landlords. Samurai was professional soldier of Japan in feudal age. Thus, even in a society where people are cultivating land and carrying loads with cow or horse, there is surplus in the society as a whole. This means that if all people are good people and they solve all the problems by discussion, there is no war and no poverty even in a society where people are cultivating land and carrying loads with cow or horse. But, in the present age, technology is incomparably high as compared with the feudal age, war has not been eradicated yet. So, we can say that technology is important for human happiness but discussion by all people is much more important. So, if we want to make world better, we must try to solve problems by discussion. This is the reason why World Parliament is necessary. Actually, development of technology has been raising our income. But we can say that development of technology is useless for world peace if there is no place for discussion like World Parliament. Which is better, the League of Nations or the United Nations? In a sense, United Nation is an improved version of League of Nations. But there is, at least, one example that shows that League of Nations is better. In 1931, Japan invaded Manchuria. Manchuria is located in northeastern China and the area is about three times as large as that of Japan. Chinese Nationalist Party appealed to the League of Nations and the League dispatched the the Lytton Investigation Committee to Manchuria. The league, considering the report of committee, passed a resolution with 42 (in favor), 1 (objection by Japan), 1 (abstention) that Japan should withdraw from Manchuria. But Japan withdrew from the League and this led to the war against USA from 1941. On the other hand, at the United Nations, there were some cases that shows the defect of United Nations. The most serious problem is that USA, the most powerful country in the world, does not respect the United Nations. For example, in 2003, USA invaded and occupied Iraq without the resolution of United Nations. USA insisted that Iraq has weapons of mass destruction. But actually, Iraq had no such dangerous weapons that threatens the happiness of American people. It is said that the true reason was to secure the oil deposit that was the second largest in the world. USA must respect and follow the resolutions of United Nations. There are many problems in the world politics. Ignorance of United Nations is one of the most serious problems. United Nations did not passed the resolution that USA should withdraw from Iraq. It seems that the veto was the basic obstacle for this resolution. Thus, at least, with regard to resolution on the Manchurian Incident and Iraq invasion, we can say that League of Nations is better. So we must establish World Parliament. Also eradication of poverty must be considered. People could live even in the Primitive Age. In the present age, technology is incomparable with that in the Primitive Age. But, still, there are poor people. Basically, poor people are poor because they cannot get a job. So, employment must be provided. World System of World Federation and World Government can improve this situation. On 11 September 2001, four jetliners attacked World Trade Center, Pentagon, etc. About 3 thousand people were killed by this attack. US government judged this to be the attack by Al-Qaeda that was an Islamic warrior group staying in Afghanistan. In October 2001, USA and some other countries implemented air raids on Afghanistan and occupied it. Furthermore, in March 2003, USA and other forces attacked Iraq and occupied it. USA insisted that Iraq has weapons of mass destruction . These two attacks were conducted without the resolution of United Nations. Since then, Afghanistan and Iraq have been occupied by USA and coalition forces, and suicide attack by Islamic warriors sometimes happens. It is said that at least 900 thousand people have been killed in Afghanistan and Iraq since the attack by U.S. troop and coalition forces. USA attacked these countries without resolution of United Nations. This is very bad. But, suicide attack by Islamic warriors is also bad. Like the attack on 11 September 2001, suicide attack to other countries give reason for occupation of a country where suicide attackers are staying. World Party recommends nonviolence and disobedience. Mahatma Gandhi led India to independence by this method. Since the independence of India in 1947, India has been an independent country. Here, we should think why Afghanistan and Iraq were attacked and occupied while India is not attacked and occupied. Needless to say, India has nuclear weapons and this is one of the reasons for independence of India. But it seems that nonviolence and disobedience are the essential cause of the perpetual independence of India because India got the independence by the policy of nonviolence and disobedience without the nuclear weapons. The policy of nonviolence and disobedience is named Mahatma Gandhi Initiative. This policy is one of the basic policies of World Party. Present China is growing in many aspects of society. Especially, economy is growing steadily. It seems that the most serious problem in China is the situation of politics. Politics in China is dominated by the communist party. In the future, multiple parties should be allowed to promote the democracy in China. World Party China is very beneficial for China because the seats in the World Party Convention is in proportion to population although one country can have up to 20% of total votes of attending delegates. Political party that cooperates internationally can promote the democracy in country where the democracy is difficult because people in the world gather and form a party. World Party recommends Chinese people that China should admit the multi-party system. At present, in Japan, the most serious problems in politics and economy are that Japan may return to the militarism if the U.S. troop withdraws from Japan and that national finance of Japan is going bankrupt. Especially, the second problem is going to happen soon. The basic cause of these two problems is in the Emperor System. With regard to politics, there is a fear that Japan may return to the militarism. In the period from around 1930 to 1945, Japan was under the militarism and the Emperor was at the top of regime. We must not forget the history of war. In 1931, Japan invaded Manchuria. This is the Manchurian Incident. China appealed to the League of Nations, and in 1933, the League passed a resolution with 42 in favor, 1 against (Japan), and 1 abstention that Japan must withdraw from Manchuria. But Japan withdrew from the League. On the other hand, in Japan in 1932, Prime Minister Tsuyoshi Inukai was murdered by young navy officers. This is 5-15 Incident. Prime Minister Inukai was elected democratically. But he was murdered. This incident terminated the infant democracy of Japan. In 1936, 2-26 Incident occurred. About 1,500 army soldiers carried out a coup and killed some important politicians. Participants of these incidents were punished but these incidents destroyed the democracy of Japan. Japan proceeded to the militarism. After these incidents, virtually, prime minister was appointed by the military authority. These incidents are past history, and now Japan is democratic and economy is prosperous. But this situation has been maintained under the existence of U.S. troop. If U.S. troop leaves Japan, the political situation is same as that of period of militarism. Namely, incident like 5-15 Incident and 2-26 incident can occur. So, Emperor System must be abolished and the president system must be introduced. But, even if the Emperor System is abolished, it is possible that the Emperor continues to exist as the head of a religious corporation. With regard to economy, bankruptcy of national finance occurred sometimes in the history of Japan. In that age, Japan was ruled by Shogunate and the head of Shogunate was appointed by Emperor. For example, in the Edo Period (1603-1867), Shogunate had to issue the order to bilk the debt. In present Japan, national finance is going bankrupt. Debts of government are about 200% of GDP of Japan. So, in the near future, government of Japan will have to take measures such as stopping redeeming national bonds. Bankruptcy of national finance is due to the traditional politics of Japan. Namely, Emperor is hereditary, and so privileged people around Emperor make the economy go bankrupt. In the feudal age, privileged people around Emperor were Samurai, feudal warrior of Japan. In the present age, privileged people around Emperor are government officials. Officials of ministry of finance make the budget of national finance Japan. This budget is the cause the bankruptcy. In order to prevent the bankruptcy of national finance, Emperor System must be abolished and the president system must be introduced. Thus, in order to solve above two problems, Emperor System must be abolished and the president system must be introduced. If Emperor System is abolished, better authority is necessary. If there is no authority, domestic conflict cannot be settled. Namely, Japan may fall into the state of anarchy. World Party Declaration can give the authority to the World Party Japan. This is because the Declaration is declared as the joint statement of all the branches of World Party. Thus political party which cooperates internationally can be an authority better than the Emperor System. Needless to say, North Korea and South Korea were one country before World War II. So, nation is same in both countries. North Korea is an independent country and no foreign troop is staying. If North Korea is invaded, China will assist North Korea. Recently, North Korea developed nuclear bomb. On the other hand, South Korea is also an independent country but U.S. troop is staying. In this situation, it is clear that Korean peninsula will be ruled by North Korea if U.S. troop withdraws from South Korea. Korean people hope unification of Korean peninsula but people in South Korea do not hope the unification by the force of North Korea. In this situation, United Nations can play its role. United Nations should make a roadmap for unification of Korean peninsula. In this roadmap, leaders of North Korea should be exempted from any punishment for crimes and their status and asset should be secured to some extent. U.S. troop continues to stay in South Korea but must not advance to North Korea. Under these conditions, election of President of unified Korea should be conducted. These can b carried out under the observation of United Nations. Somalia has many natural resources, and the resources attract many foreign forces. Somalia has no proven oil reserves. But it is said that the reserve of oil is second only to Sudan. And also Somalia has untapped reserves of natural resources such as uranium, iron ore, tin, gypsum, bauxite, copper, salt and natural gas. Companies from abroad are exploiting these resources. Somalia got independence in 1960. But armed clash has never been eradicated yet. Especially in 1991, civil war broke out, and Somalia enter the situation of anarchy. The United Nations forces intervened in Somalia. But 19 American troops and more than 1,000 civilians and militia were killed in October 1993, and the United Nations forces withdrew in 1995. Now, there are many conflicts including piracy. In this situation, how will be the role of World Party Somalia? World Party Somalia will get the support of people because it is an international political party. Somalia needs an political party with solid authority. USA is the most powerful country in the world. Politics is democratic and economy is the biggest in the world. Its role in the international society is great. But international policy of USA has some serious problems. The most important problem is that USA does not respect United Nations. Yugoslavia, Afghanistan, Iraq, etc. are examples. USA carried out air raids to these countries without the resolution of United Nations. With great power comes great responsibility. The most powerful country in the world does not respect United Nations. This is a heavy crime. If the most powerful country in the world respects the United Nations, other countries cannot ignore it. World Party recommends people in USA to respect and follow the resolution of United Nations. World Party is not the enemy of USA. World Party wants to be a true friend of USA. So, World Party recommends the best policy to be taken in the international society. 16 May: World Government Institute Austria was founded. 10 October: World Government Institute France was founded. 31 January: World Government Institute Thailand was founded. 23 April: World Government Institute Switzerland was founded. At present, there are 51 branches. 16 May: World Party Austria was founded. 10 October: World Party France was founded. 31 January: World Party Thailand was founded. 23 April: World Party Switzerland was founded. At present, there are 50 branches. 31 January: UHG (United Humanity Group) joined. 16 May: World Party Austria joined. 10 October: World Party France joined. 6 November: Organization for Peace and Disarmament in South Africa (OPEDISA) (Zimbabwe) withdrew. 31 January: World Party Thailand joined. 23 April: World Party Switzerland joined. At present, members are 63 organizations and 1 individual. About 2 thousand Yen, fund for mailing the journal, participating conferences, etc., was paid from the private fund of Webmaster. Mr. Takeo Nakamura (Japan). 12,000 Yen. Thank you very much for donation. All the preceding anonymous donations were from Mr. Takeo Nakamura. His name is published here following his agreement. Donation will be spent for truly meaningful things. About 30 thousand Yen, fund for website, Internet access, participating conferences, etc. were paid from private fund of webmaster. Mr. Takeo Nakamura (Japan). 1,000 Yen. Thank you very much for donation. All the anonymous donations and the donation in this fiscal year was made by Mr. Takeo Nakamura. His name is published here following his agreement. Donation will be spent for truly meaningful things. First World Party Convention is going to be held in Ghana, Africa in August 2011. Idea of World Party is based on a book Soul Federation (Forthcoming). This book has been completed and so the Convention is held. This book is going to be published within few months and will be available from Amazon or bookstore. The Convention is held once in four years. Delegates of each branch will meet and exchange opinions. Please read World Party Statute. Basic process until the opening of the Convention is as follows. You must get registered at least one year before the Convention. The deadline for the registration is 31 July 2010.
you can participate in the World Party Convention as a delegate. After identifying the policy of World Party, the declaration is issued. What is the policy of World Party? 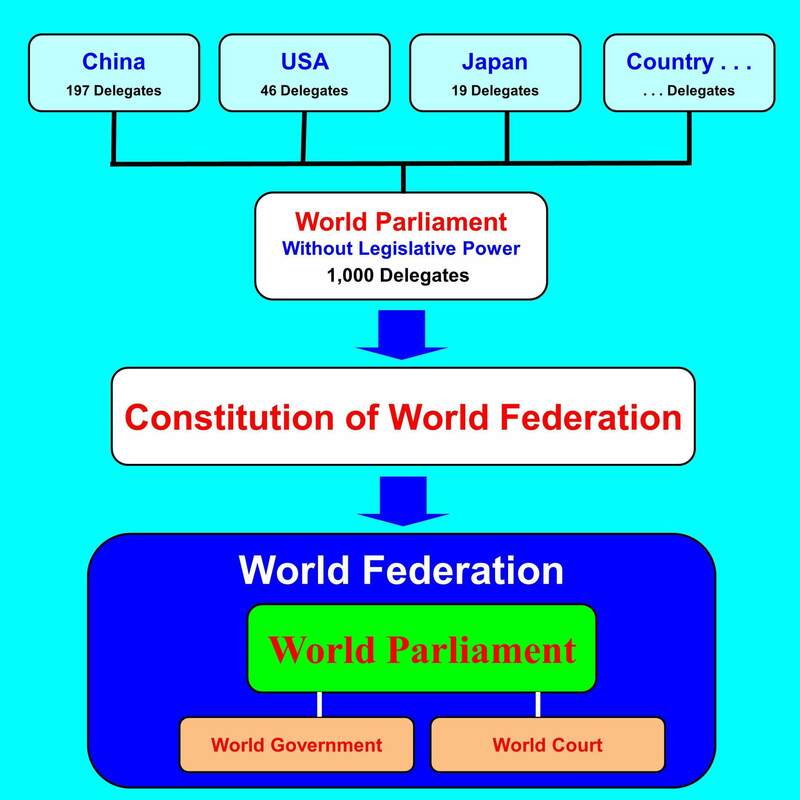 As shown in the figure below, on the first stage, the policy of World Party is to establish the World Parliament without the legislative power like the European Parliament. This parliament is composed of two houses and each house has 1,000 delegates. Members from each country are apportioned according to the population of each country. At the time of establishment, World Parliament is a consultative assembly without the legislative power. After getting the legislative power, it will enact the World Constitution. World Federation is a worldwide federation of independent countries and the World Government is the central government of the federation. World Government is concerned with the administration of military force, the control of currency, and other issues that cannot be solved by each country alone. Matters such as religion, political and economic system such as liberalism or communism, industry, agriculture, commerce, science, arts, and so on are free for each country. So, countries in the federation can declare either liberalism or communism. For further detail, please see the World Party Statute. World Party Convention is held once in four years following the World Party Statute. The Convention is the supreme body of World Party. Delegates from each branch must get registered at least one year before the Convention. So, only the members who had got registered until the end of July 2010 can participate in the Convention as the official delegates. If there are problems in the delegates, other registered delegates can object to the delegates. If the objection reaches 5% of total vote, the objected delegates must be removed from the registered delegates. So, there is no corruption in the World Party. The seats of the Convention are one thousand and they are apportioned in proportion to population of each country. The seats of the Convention is shown in the Branch List of World Party. In case of Ghana, the seats are 3.49. So, World Party Ghana can register 11 delegates (3.49 multiplied by 3 is 10.47). From among these 11 delegates, 4 delegates can participate in the Convention as the official delegates. For the detail of calculation, please see the World Party Statute. At the Convention, President is elected and basic policy of World Party is identified. The declaration will be issued at the closing session. The World Party Convention is the base of authority of World Party. You can apply through Application Form or to the branch of each country directly. Basic program is as follows. The above is a basic program. Other events such as session for World Citizen Network, social gathering, etc. will be held. Prior registration is not necessary for the conference of World Citizen Network. World Party Convention is going to be held. So, World Party Japan is going to found a political body and register it to prefecture office of Chiba Prefecture in Japan. The political body can receive official donation from supporter. If people donate the fund necessary for election, World Party Japan can send candidates for election. Three persons, a representative, a person in charge of accounts, an agent of person in charge of accounts, are necessary for registration. Anyone who wants to work for this political body is invited. Please contact World Party Japan. 2 April: World Government Institute Guinea-Bissau was founded. 8 August: World Government Institute Bulgaria was founded. At present, there are 47 branches. 2 April: World Party Guinea-Bissau was founded. 8 August: World Party Bulgaria was founded. At present, there are 46 branches. 2 April: World Party Guinea-Bissau joined. 10 May: DUDE & GOOD, Inc. (Corporate Citizenship) in USA joined. 8 August: World Party Bulgaria joined. Members were 59 organizations and 3 individuals on 31 December. At present, members are 60 organizations and 2 individuals. are administering the following accounts. Accounts are published in each site. 1 Dollar is about 97 Yen in April 2009. About 2 thousand Yen, fund for mailing the journal, participating conferences, etc. was paid from the private fund of Webmaster. About 30 thousand Yen, fund for web site, Internet access, participating conferences, etc. was paid from private fund of Webmaster.